Our Vin Rose is pink in color, slightly sweet with a delicate bouquet of fresh berries with just a touch of apple and citrus. Our Haut Sauterne is pale gold in color, delivers a hint of apricots and honey with a light nutty finish. The wine is delightful with a slightly sweet finish. Our Chablis is pale straw in color, light bodied with a delicate bouquet of honeyed peach and a slightly tart finish. Our Burgundy is a medium bodied red wine, carries a cedary vanilla overlay to the ripe currant and plum flavors. It is light on tannins and has a smooth finish. Our Rosato is one of our most popular wines. It is delicate, sweet and pink in color. 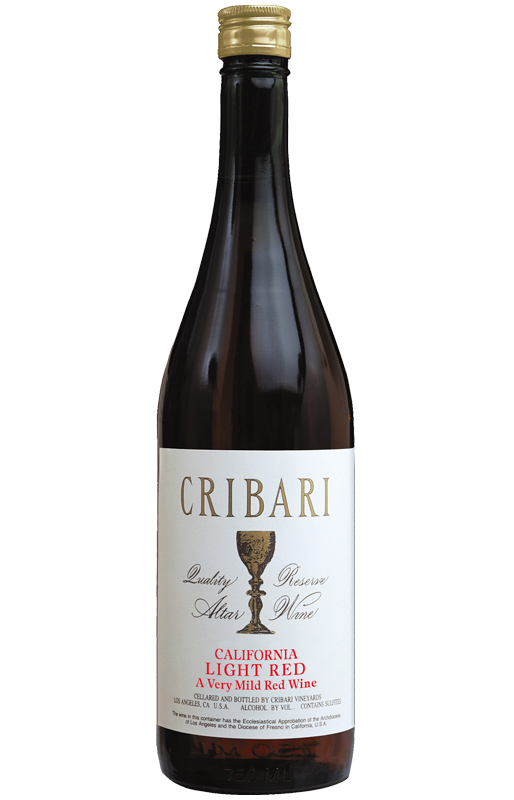 Cribari Rosato is a fine choice for the Holy Sacrifice, especially for Communion under both species. Our White Rosato follows the same concept of our distinguished Rosato but is straw in color. This wine is lightly sweet with hints of pears, apples, and Vanilla. The Light Muscat is light amber in color with a delightful Muscal bouquet. Dark pink in color, our Light Red carries silky tannins with fruit forward flavor. Light Red is not quite as sweet as Rosato. Golden in color and pleasantly sweet, the Golden Angelica originated in the cellars of France. One of our most popular sweet wines, the Golden Angelica has been considered exclusively a sacramental wine. A red amber wine, medium sweet with a subtle texture and delightful aroma. Originating in the highlands of Hungary, where the quality of grape depends more on the sun than on the rain, Tokay has a relatively high alcohol content at 18%. Available in 750 ml only. Port is rich, ruby red, sweet, smooth and full bodied. It has always been valued by connoisseurs for its mellowness. Available in 750 ml and 4L.